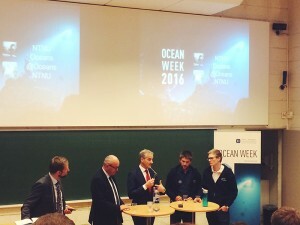 Every year, the Norwegian University of Technology in Trondheim hosts the Ocean Week. It is organized by NTNU Oceans, one of the four strategic research areas declared by the university in 2014. The conference aims to offer insight into anything related to the ocean: research, technology, politics and economy. Professors, representatives of the industry, researchers of well-known institutes and students participate in the conference by talking about current innovations, ideas and future challenges. The goal is to gather and connect interested parties to work on a sustainable future of the oceans. As a mechanical engineering student it is not the most obvious decision to go attend a conference in a very small city in upper Norway where it is cold while Berlin is reigned by all the serotonin dancing around in the beautiful month of May. But as a mechanical engineering student it is also known that we do not get much practical insight and are restrained to our theories unless we step out of our square construction box and reach for opportunities. After having read The Swarm by Frank Schätzing years ago—a very recommendable book for anyone who is into the absurd and scary but actually kind of logical future of our planet— I was not able to stop thinking about how we can shape the future of our oceans. One thing that was mentioned at the conference later is the 70-80-90 principle: 70% of our planet is covered by ocean, 80% of it is deeper than a few hundred meters, 90% of it is completely undiscovered. Mechanical engineering with its multiple specializations, for example ocean engineering or robotics, allows to prepare for this daunting confrontation with a complete unknown universe that we live with right below us. 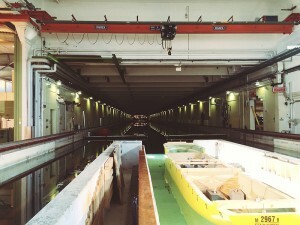 I came to know about the Ocean Week while hunting for possible Master programs in Marine Technology. When I read about it, I immediately knew I had to go and use this opportunity to see whether this field which I think is my passion is indeed what I imagine it to be. When confronting Professor Thamsen, who I knew had close ties to the NTNU, he offered me to undertake this trip and participate in the conference through the Nordic Water Network. So off I went to Trondheim! How can we feed a rapidly growing world? How can we provide clean energy? How can we develop environmentally friendly and sustainable transportation?